Are you sick of cake and cream yet? I nearly am and that's saying something! 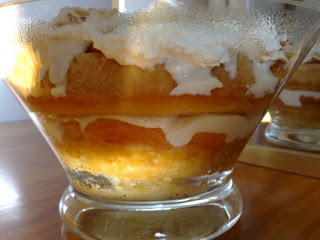 I made this trifle for a Christmas in July dinner with the family this weekend. Trifle was always my favourite dessert when I was little - filled with bought jam roll, lots of red and green jelly and artificially yellow custard. These days I have (slightly) more sophisticated tastes. This trifle is built around homemade sponge cake with a filling of dried peaches and orange slices which are poached in a sugar syrup subtly spiced with cinnamon, cardamom and brandy. Yum! The kitchen smelt absolutely divine with this bubbling away on the stove. And quite Christmas-y too I think. Preheat oven to 180 deg C (I did 160 deg fan forced). 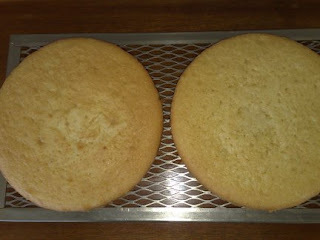 Grease two shallow 20cm (8in) round cake tins and line the bases with baking paper. Sift flour 3 times and set aside. 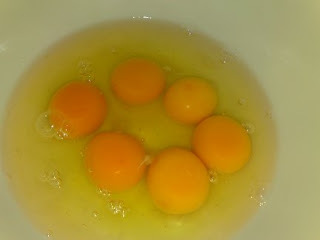 Place the eggs and sugar in the bowl of an electric mixer and beat for 8-10 minutes or until thick and pale and tripled in volume. 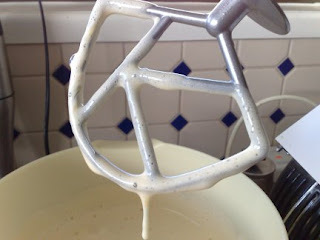 Sift the flour over the egg and sugar mixture and gently fold through using a metal spoon. Then fold through the melted butter. Pour half the mixture into each tin and bake for 25 minutes or until the cakes are springy to touch and come away from the sides of the tin. Cool on wire racks. Decorate as desired (I would normally fill them either jam and cream or lemon curd and dust with icing sugar). Serves 8-10. Place one cake layer in the base of a 2-litre (8-cup) capacity glass serving bowl. Place the dried peaches in a medium saucepan with brandy, cardamom pods, cinnamon stick, orange rind, orange juice, sugar, and 3/4 cup (185ml) water. Place over high heat and bring to the boil. Reduce heat to low and simmer for 10 minutes or until peaches soften. Add orange slices and then set aside for 10 minutes to cool. Spoon half the peach mixture over the oranges and top with vanilla custard. Repeat layering with remaining cake, orange slices, peach mixture and custard. Cover with plastic wrap and place in the fridge for 3 hours or overnight to develop the flavours. 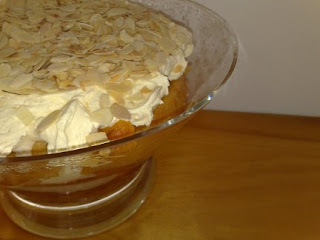 To serve, top with lightly whipped cream and sprinkle with toasted flaked almonds. Overall it got a big thumbs up from everyone. 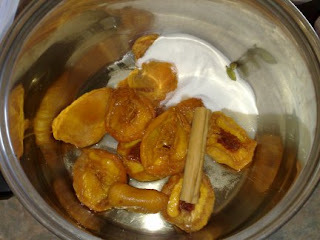 I think next time though I will make double the syrup and simmer the spices in it before adding the fruit. The cinnamon and cardamom flavours weren't as pronounced as I hoped they would be. But it was still delicious and a great end to the meal.